**UPDATE: Due to copyright laws, I have unfortunately had to remove some of the very helpful photos in this post. I’ll leave links to the photos so you can go check them out for your reference. As I was weeding my flower bed one day, I noticed that one particular weed looked remarkably like a carrot top. I even questioned whether it was possible for some of the seeds from my garden to have been carried over and dropped in with my flowers. And then when I pulled the weed and smelled the thin root, it smelled exactly like a carrot! I took it inside and googled “wild carrots”. Sure enough, that’s what it was! And yes, they are edible! But it surprised me to learn that these are actually immature Queen Anne’s Lace plants. First year growth doesn’t develop a flower head, and the whole plant is good to eat. Once they get their distinct umbrella shaped white flowers on top, the flavor becomes woody and is no longer desirable. I recognized these flowers from being all around our property. My dad always called them Chigger Bushes, because of the little chigger bugs that jump off of them and cause itchy bites. We were always warned to stay far away from these blooms. But hey, if they’re edible I’ll take my chances! Besides, a little clear nail polish over the bites is all it takes to kill the burrowing insect. In my reading, I also learned a very important tip. Queen Anne’s Lace has a deadly look-alike, Hemlock. Even touching Hemlock can poison you, and ingestion means almost certain death unless treated immediately. As the toxins from the plant absorb into your system, you slowly become paralyzed, your respiratory system fails, and you die. Terrible. I know. So you definitely need to know how to distinguish between the two plants. 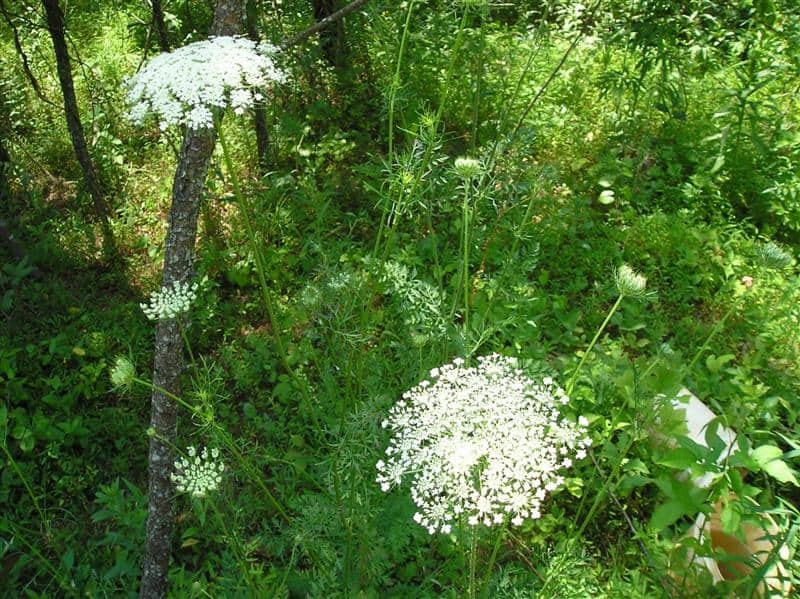 Fortunately, there are several very clear differences between Queen Anne’s Lace and Hemlock. It’s pretty easy to tell them apart once you learn what to spot, so don’t be afraid to try! Yesterday, I took the kids on a nature walk so that I could teach them how to properly identify Queen Anne’s Lace and to be able to distinguish it from Poison Hemlock. It would be terrible if the kids spotted some hemlock and picked the flowers thinking they were beautiful. We weren’t able to find any on our property, thankfully, but it’s always good for them (and myself!) to know the difference. Although they both have umbrella shaped tiny white (or sometimes pale pink) clusters of flowers, Queen Anne’s Lace has a teeny tiny purple or crimson colored flower in the center of its blooms. See it in the picture? It isn’t always there, sometimes it has already withered, or hasn’t developed yet. But if you see this, you know for sure it’s Queen Anne’s Lace. The story goes that Queen Anne was making lace when she pricked her finger and a drop of blood fell into the middle of her work, this is how the plant got its name. Telling the story is a good way for kids to remember which plant is supposed to have the purple flower. Hemlock looks a bit different, when you get close enough to really get a good look. Though it would be hard to accurately tell the difference every time by only looking at the blooms. Thankfully, the stems are a dead giveaway. Queen Anne’s Lace has a hairy, completely green stem. Poison Hemlock is smooth, and has purple or black spots, or streaks on the stem. Another identifier is the way the plants look when the blooms are dying back. Queen Anne’s Lace will fold up like a bird’s nest. Hemlock will not fold up as it goes to seed, but will just turn brown instead. But the REAL test is the smell. If you’ve found a flower and you are fairly certain that you’ve identified it as a Queen Anne’s Lace, the final test is to crush the stem a little then smell. If it smells like a carrot, you can know for sure that it’s Queen Anne’s Lace, and it’s safe to eat. If it stinks, or has a musty/yucky smell, go wash your hands, it’s possible that the plant is Hemlock. So, once you’ve determined you do in fact have Queen Anne’s Lace, or “wild carrot”, how do you use it? Roots: Use in soups, stews. Freeze; dry. Leaves: Eat raw; steam; boil; saute; drink liquid used for cooking. Use in soups and stews. Freeze. Flower Heads: Eat raw; fry. Seeds: Collect in autumn and dry for salt substitute. Don’t forget to try making Queen Anne’s Lace Jelly!! Would you be interested in foraging for wild carrots? Do you know if you have any Queen Anne’s Lace growing in your area? Samuel Thayer’s book “Nature’s Garden” is an excellent resource on this subject, as it is exceptionally detailed with pictures (check out the chapter on wild carrot. There are actually 5 different kinds of hemlock (poison hemlock, bulblet water hemlock, common water hemlock, western water hemlock, and northern water hemlock, and yes, they all look slightly different) and all of them are extremely deadly. He goes over them in one of his other books, “Incredible Wild Edibles” in the chapter about water parsnips. All three of his books are very detailed and since he only writes about wild foods that he himself eats, you can rest assured that he knows what he’s talking about. I feel I must point out with a few people here that hemlock does NOT smell bad. In fact, it smells like a vegetable, very mild. Water parsnip on the other hand, which is entirely edible, can have a pungent scent when crushed. In reality the absolute best advice is to NEVER identify a plant using only ONE feature. Take the time to learn a plant in all its growing stages so you can identify it at any point, then take the time to do the same with all of the plants look-alikes, and DO NOT eat a plant unless you are 100% certain of what it is. If you have to run for your field guide/google/friend who taught you/etc. 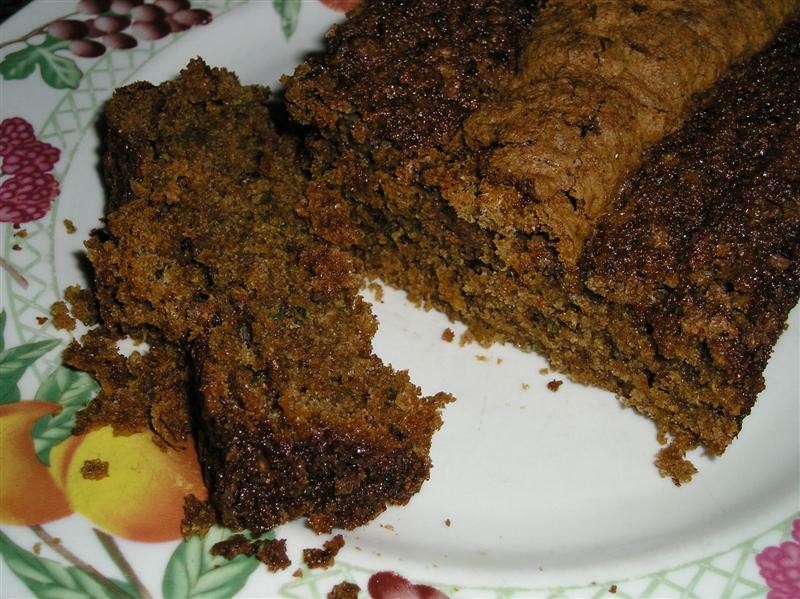 then you aren’t 100% certain and you should practice identifying the plant further before you eat it. 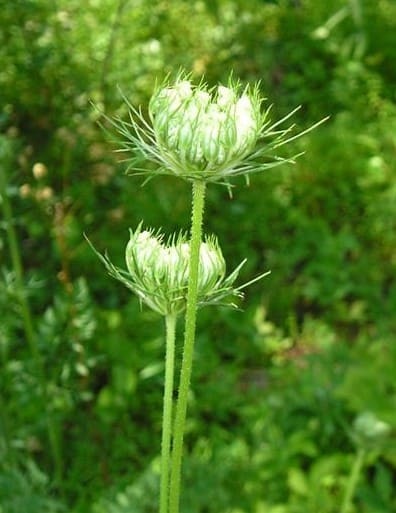 And finally, wild carrot seeds are used as a natural form of birth control, so pregnant women or women trying to become pregnant should not eat them. chiggers are not “burrowing insects”. If you are going to blog on nature topics, you need to do some research so you don’t promote misinformation. I’m sure you have a lot of sound advice and information to share on homesteading, but when I see a blatant error like this, it makes me distrust any other information you write about. The author of the article was referring to, at my best guess, chiggers tendency to burrow into skin and bury their heads and bodies in flesh so they can further gnaw and access blood, similar to how a tick buries it’s head. Not that chiggers are insects that burrow say, in the ground. I have a swamp across the road from me, I’ve seen Queen Anne’s Lace (it has a fuzzy stem, which being Autistic it feels cool to me). I never knew of Hemlock before, but knowing that it has a different stem, I’ll keep a sharp eye out for it. I loved everything about this post. Thanks Kitty! A fellow horseman lost two of his horses to poison hemlock that had been bailed in with his hay. That was how we learned of this deadly plant. The diagnosis was made by the University of Illinois Veterinary Clinic. I had know idea this plant was dangerous even to the touch and now that I know how to easily identify hemlock I will watch everywhere for it around the farm, in the pastures, and in the hay fields. Thank you for this vital information. How terrible, Sally! That’s such a tragedy. Thanks for sharing with us so others can be more aware. Thanks for the helpful article. For the record, you can post those copyright images under Fair Use as the purpose of this article is to educate. Do not go by smell! This article is misleading. Water Hemlock has a carrot smell and is very poisonous. Do some research on the USDA website. Here is a link with pictures and information. You may want to add a few things to your story, such as there 2 kinds of Hemlock, Conium maculatum, (poison hemlock) and Cicuta (water hemlock). And that Angelica’s and Water Parsnip (Berula spp.) 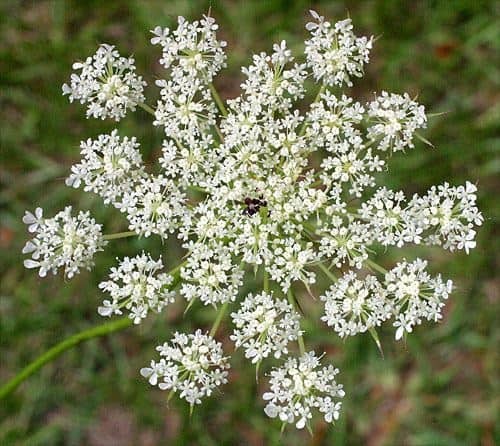 also resemble Water Hemlock while Osha and Queens Ann’s Lace resemble Poison Hemlock, but all can be confusing to a beginner just learning to identify plants. Learn you plants and their look alikes. Apiaceae: Plants of the Parsley or Carrot Family (Previously known as the Umbel Family: Umbelliferae) the most distinctive pattern of the Parsley family is the “compound umbels”. If it’s an umbel and you don’t know it then leave it alone. Thank you for your reply! In the original article, I find this article disturbing as there are plants that smell like carrot and you are saying those might be edible. You cannot go by smell as a indicator that it is good to eat. Water hemlock, which is a tubular plant, is very poisonous smells like carrots and can kill dogs, cattle and probably humans as well. Angelica and hog weed look alike. Hogweed is a noxious weed and can cause many medical ailments. I have seen this stuff growing wild in a swampy ditch about a mile up the road. A neighbor told me it was valerian. I was going to go try to dig roots when the weather cooled off. Thank God I read this article and did a bit more research! No more just taking someone’s word on what an herb is, I will always check first. Thanks for saving my life! Chiggers don’t burrow they secrete saliva that digests skin. The itching is from those enzymes and you immune system. AND, by the time the bites start itching, the bug is LONG gone. Nail polish doesn’t help a bit but polish remover will burn enough to make you forget about the itch. Great article! Thank you for taking the time to write this up. You helped me EASILY identify some unknown “wildflower” at my work as wild carrots. Like you, I quickly learned that it could have been poison hemlock, and wanted to know how to tell them apart. If you follow her well written advice, you will FIRST check for SMOOTH or HAIRY stem (or crimson center flower). Then, once you know you probably have wild carrots, you can do the smell test to know for sure. I smell everything, and thought it was neat that you included this as a way to ID. P.S. Playing with fire would be recommending the sniff test first! So glad you found the info helpful, Jimmy. 🙂 Thanks! Smell??!! You’re instructing people to tell the difference between two extremely hard to ID plants, one of which is incredibly deadly by smell? Playing with fire. They aren’t extremely hard to ID once you know what you’re looking for. 😉 Smelling the plant won’t hurt you, especially if you protect your hands if you have to pull the plant up or break it to smell it. I would HIGHLY suggest using disposable rubber gloves if you are going to be touching what may or may not be a poisonous plant, especially hemlock. My instructor in herb school told us a very noted and senior herbalist who was picking watercress, something she had done a million times, only this time there was just a time piece of what was later to be identified as an immature hemlock hidden in among the cress that she collected and ate. She died. She was well versed in herbs. Don’t take chances. Oh my gosh, that’s terrible! Thank you for the warning. How scary indeed. They aren’t “extremely hard to ID” what-so-ever. Maybe to a beginner it might be tricky, but they are actually quite easy to identify. Although, I do agree that you’d have to be a pro to ID a plant alone by smell. Also…there are poison plants that smell like carrot, so that’s not a distinctive factor. You should still learn the difference. If you touch poison hemlock with your bare skin and the oils get into a cut or scratch, you could still be poisoned. At least wear gloves when you’re dealing with it, just to be safe. My grandmother showed me the difference on her farm when I was little. I wish I had gotten seeds from her while she was alive because I have never seen it here. I want to try growing it myself. Does anyone know where I can get seeds? I can only find a domestic online. Honestly, wild carrots aren’t worth trying to cultivate for food. The roots are small and not nearly as pleasant as garden carrots. I’d mainly only use them for survival food if I had to depend on foraging in the wild. We used to put Queen Anne’s Lace in jars with food coloring and water. In mere hours, the flower heads would change color. They can then be dried and used in arrangements–beautiful! Thanks for sharing about putting Queen Anne’s Lace in jars with food coloring. I didn’t know that. Since watching Anne of Green Gables the Queen Anne’s Lace has been a all time favorite of mine. This year I started a section of land in my yard and am putting certain wild flowers in it. I love going y the road side and seeing all the Lace standing so tall and royal. I have known about and loved Queen Anne’s Lace as I found it growing about our yard and property. I’ve never used it, even though I was quite aware that it was also wild carrot. Last weekend I was at the coast and saw what I thought was giant Queen Anne’s Lace growing all over our daughter’s in-laws’ property but was told it was Hemlock/wild carrot/Queen Anne’s Lace! They all said it was the same thing! It looked exactly as I always thought wild carrot looked so I was a bit startled. Obviously my wild carrots and theirs aren’t the same because over the years I’ve jerked some of mine up to feed to the horses and they are still fine, not to mention I have had no negative effects from handling it. Thank you so much for this incredibly clear article on the differences. I sent a link to my daughter so she will be able to identify the clear differences. Yikes! I hope it isn’t Hemlock. I’m glad I was able to help you guys discern the difference. Definitely a good thing to know. I’d be very concerned about the “giant Queen Anne’s lace” because it’s likely hogweed. Touching hogweed can cause severe reactions, it doesn’t need to be ingested that one. 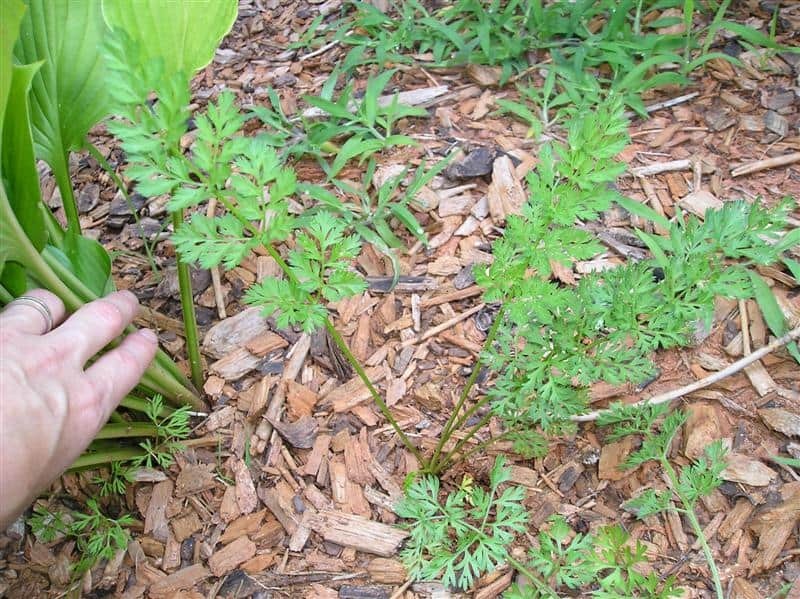 Are the leaves of the water hemlock those same fluffy carrot-top type? I’d encourage you to do an online search to compare the leaves of both plants. Since we don’t have hemlock growing in this area, I can’t advise you from any personal experience. We have poison hemlock close to our garden. Our garden is called “Seeds of Harmony”. It is across the field. For years we had that in our garden. I was in charge to take of the poison hemlock. one summer day I had a workshop on poison hemlock. Myself, I am aware how dangerous plant it is. I told the gardeners if they see that plant in their gardens. Please let me know A.S.P. I will care of the hemlock. I read up on the poison hemlock. Like yesterday we go to a mtg with new gardeners. I gave them a lot of information. Great article! I did not know about what to look for in the stems. My son recently had a burn/rash from contacting what I believe was either poison hemlock or water hemlock so I have been doing some research. Great info to add. Thanks, Amos! Great post, it was very informative and helpful. Great article!! I planted carrots from seed this year (first time, not realizing how small they were) on a windy day, next thing I know I have carrots everywhere in my garden, coming up with the weeds. Then I started realizing they were not quite the same!! Most, I am finding out, are wild carrots, not from the seed that I have planted. I am glad to have found your article because I did not realize hemlock looked so much like the wild carrots!! Now I know and I will be on the lookout, Thanks for the great information. I’m glad to have been some help, Melonie 🙂 Too bad your garden carrots didn’t spread and pop up everywhere, that would have been GREAT, LOL! Thanks!! Your article describes and pictures the two better than any I’ve seen!! Chickens coming soon and needed to know the difference!! I sure hope we have an abundance of the GOOD stuff!!! seeds should NOT be eaten by pregnant women. QAL seeds are also being studied as a natural birth control. Thanks for your post. Just a few days ago the kids had picked a queen ann’s lace flower and put it on the table in a vase. Later I was dishing out soup for lunch and some pollen got knocked into my daughter’s soup bowl. My husband and I both had recollections about something poisonous (probably we were thinking of hemlock) so we threw her soup out. I guess we’ll know better for next time. I was thinking it’s just a wild carrot, it should be fine. We’re actually trying to save carrot seed for the first time this year – we planted some carrots that managed to overwinter in the garden and their flower looks like queen ann’s lace! Well, better safe than sorry for sure! But at least now you know 😉 Interesting that your carrots look like Queen Anne’s Lace. I hope saving seed works out well for you guys! I went on a walk out behind our property today to check on the blackberries and saw some Queen Anne’s Lace and thought of your post. I never knew its name or anything about it until I read your post. Thanks for the info. Also the blackberries have started to ripen and bright and early Monday morning I will be out picking. My mother and I used Queen Annes Lace for a wedding ,it was beautiful!She used to arrange flowers and the couple didnt have alot of money to spend for flowers so they ask her to do it. I read this post, walked outside, and gave a lesson to my son, because lo and behold, Queen Anne’s lace/ wild carrots showed up this year on my property. I had no idea they were edible. Thanks for the lesson! They are quite near our wild blackberries. We have lots of Queen Anne’s Lace in our yard. Thanks for pointing out the differences with Hemlock. On a side note, chiggers. They don’t actually burrow into your skin so putting nail polish on will not help you. The larval mites inject digestive enzymes into you and form something like a straw to drink from. Once they get full they fall off and continue through their life cycle. By the time you notice the itchy spot the mite is already gone. The best way to try to prevent this is to shower and wash your clothes immediately after being in a place they live, the yard, woods, etc. I have really sensitive skin. When I get a chigger bite it looks like a giant purple hive. Some have been as big as oranges. Now I make sure to shower if I’ve been out in the yard. They are particularly bad here in WV this Summer. I’ve bookmarked this post. Thanks! Thank you. My kids were pulling up wild carrots yesterday. I made them read this with me so they know the difference. And I’m going to make the jelly! I really appreciate the information on how to identify Hemlock, compared to Queen Anne’s Lace! I’ll be checking our property very carefully! You are most welcome!! I figured this was too important not to share. I’ve had those wild carrots growing and left them alone just because they were pretty! Thanks for the tutorial! We have wild onion, raspberries, strawberries, and herbs galore. No wild carrots. Too bad. Sounds delightful. My plants teacher taught us to remember the difference of the stems by pulling up her pants leg to show her calf, which she had not shaved. She smiled and said, “Queen Anne has hairy legs.” My kind of lady! Now I will never forget! Do be careful everyone out there. Hemlock means serious business, just ask Socrates. Oh my goodness, that is too funny!! My oldest daughter and I were just reading about Socrates’ death by Hemlock. I’d never heard that story before. It’s a great way to reinforce the danger of this plant and the importance of being able to confidently tell the difference.